A simply beautiful dinosaur art print - featuring the colorful and fiercely alive dinosaur called Guanlong wucaii. This 12 x 9 inch fine art print will be delightfully fierce for years to come. Guanlong wucaii is a fierce guardian of truth & equality. © Kristen Girard | Now is the time to be bold, fierce, and strong. Now is the time to build the life you have been dreaming of... a life of curiosity, science, and the great outdoors. This beautifully fierce dinosaur, known as Guanlong wucaii, will remind you always to listen to the wise voice of your inner goddess and stride out into the world with truth and the strength you born to wield. To learn more about this colorful and fierce warrior for the truth check out the dinosaur art gallery. This gorgeous colorful fine art print depicts a Guanlong wucaii dinosaur hissing as she spots prey. Guanlong was a small carnivorous dinosaur with a big attitude and graceful athleticism. She doesn’t stand for silly shenanigans or untruths. She doesn't have time for that. She is on a path to cultivate truth, bring about equality for all, and takes pride in her ability to find solutions to problems. Are you ready to bring truth, equality, and problem solving to your life? Yes? Then bring this beautiful paleo artwork home to remind you of what you are working for. Because you are fiercely alive and and don’t take silliness from anyone. This fine art print is created with the highest quality inks on beautiful paper made to stand the test of time. The art is 12 inches wide, 9 inches tall, with a 2 inch border all around to make framing easy, and to protect the live art area of the print. Available framed or unframed. The pictures show both options – so you can choose what is best for you. Framed prints arrive ready to hang (after a bit of easy unwrapping) in a deluxe box that ensures safe arrival. This is a limited edition print. There will only ever be 2,389 these fiercely beautiful art prints. Once they are gone, they are gone for good... and won’t be back. Artwork © by Kristen Girard of Girard Illustration. All rights reserved. To find out more about what that means and how it effects you and what you can do with this fabulous print, click here to read all about copyrights and art. Each print is inspected by the artist for quality and consistency. Due to the care and craftsmanship that go into each print and frame, your order may take 3-4 weeks before it is ready to ship. Please plan accordingly. This fiercely beautiful Guanlong wucaii art print is special, and so are the frames we have chosen to set the dinosaur artwork off beautifully for years to come. We get all wide eyed at the beauty of small details, because we know you deserve only the best quality craftsmanship. Hand signed and numbered by the artist in gold hued paint. Gorgeous matte paper and amazing inks! Your master quality print will be bright and beautiful for years and years to come. Certificate of Authenticity direct from the artist, so you know your print is the real dinosaur deal. Choice of limited edition print number on a first come, first served basis. Based on availability, you can choose a special number from 1 to 2,389 when you are checking out. If your special number is already taken, you will be shipped the lowest number currently available. Each limited edition print comes with the Artist's Guarantee that there will only ever be 2,389 official 12 inches wide by 9 inches high prints. This means that each limited edition dinosaur art print is truly special. You can purchase each print framed or unframed. Custom hand made frames are specially chosen by the artist to make each artwork look stunningly beautiful for years to come. 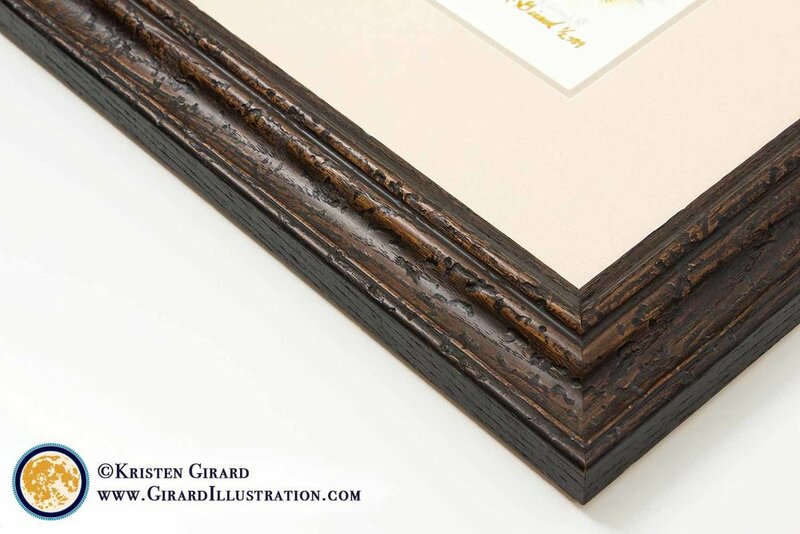 To learn more about how we frame, and why it is so amazing, click here to see all the beautiful details that make buying a framed artwork the way to go.